Reconstructing Lives: how does a prosthetic hand work? One of the questions I have been frequently asked about the prosthetic hands in our Reconstructing Lives exhibition is: how are they controlled? We use our hands for a wide variety of tasks requiring strength or dexterity and seldom think about how complicated they are and how many muscles and signals work together to make each gesture. For a prosthetic limb the user interface is vital; it needs to be simple and instinctive to operate. The wearer does not want to refer to the instruction manual, call the support desk, or even think about every motion he or she makes. The hand with the most advanced technology in the exhibition is the i-limb ultra, the latest model from Touch Bionics in Livingston. These hands look amazingly lifelike when in their cosmetic covers, and each finger moves independently which gives them naturalistic poses. We display them without skins so some of the engineering which goes into them is visible. Tying shoelaces using the i-limb ultra prosthetic hand. Photo © Touch Bionics. 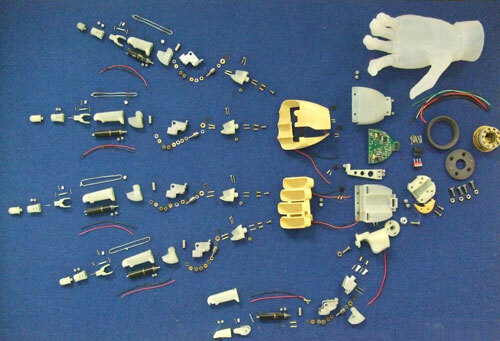 The about 300 parts which went into the first model i-limb, pinned to a noticeboard at Touch Bionics’ workshop. These hands are operated with battery power, electrical signals and an internal processor. The demonstration model that Touch Bionics sometimes kindly lend us for events comes with a torch, which acts as a replacement forearm to hold the batteries and support the hand. This torch has two pressure sensitive buttons added on the outside: one opens the hand, the other closes it. The hand can be instructed to move into more positions and modes by signalling to its internal software through holding down, or tapping on, the buttons. Curator Julie Orford with the i-limb hand on its torch ‘forearm’. 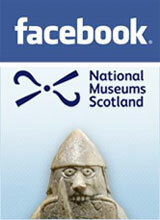 At the launch of the 26 Treasures project, visitors could try it for themselves. Using buttons, and needing one hand to control the motion of the artificial hand, is a cumbersome way of using a prosthesis. Instead, amputees control these hands through sensitive electrical sensors placed on their skin. These detect the tiny electrical signals inside muscles as they contract. Because the muscles which close and open our fingers are in the arm, below the elbow, this can be very instinctive to learn. People with an amputation across the forearm can signal to their artificial hand using the muscles which controlled their fingers. The back of a hand and arm showing the muscles and tendons which open the fingers. Gray’s Anatomy, 1858. These prosthetic hands don’t enable their wearers play a piano sonata or touch type – not yet anyway – but they will point one finger to operate a keyboard ‘hunt and peck’ style. There is on-going worldwide research into controlling prostheses directly from brainwaves, which are detected either with sensors on the skin or surgically implanted electrodes. This technology is not yet ready for use outside a laboratory, but is one of many exciting developments which may revolutionise the field of prosthetics in the future. 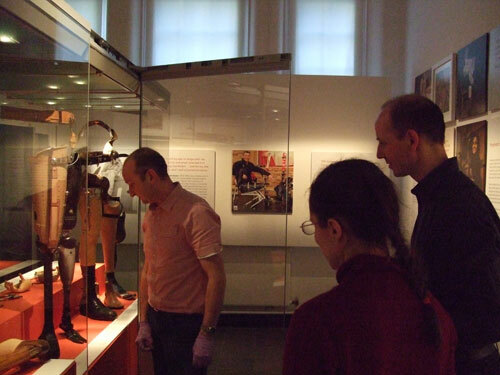 An example of the first model i-limb from Touch Bionics is also on display in Scotland: A Changing Nation at the National Museum of Scotland, and was one of the objects featured in the 26 Treasures project. 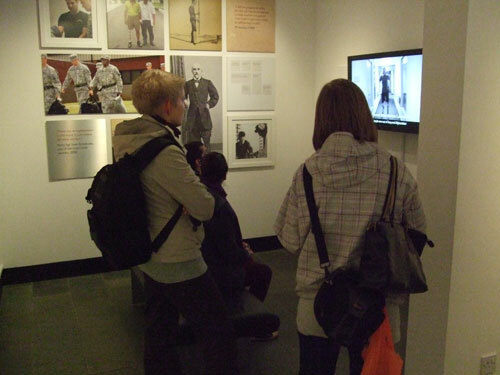 We also display the Edinburgh research leading up to this pioneering hand in the Shaping our World gallery. 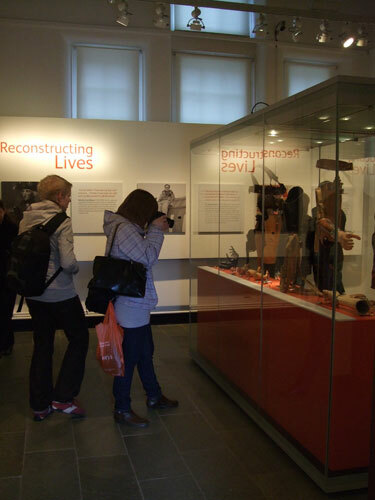 The beginning of March was busy for us in the Science section as we installed the Reconstructing Lives exhibition, which opened at the National War Museum on 9 March. 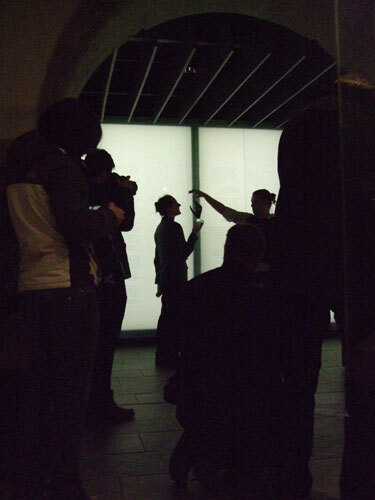 Although the exhibition is a small one, there is still a lot of hard work that goes into creating it. Over the past few months the objects were conserved and photographed, the label text was researched, written and revised and the images which bring the stories of the objects to life had to be sourced and printed. Our loans department have also been busy organising the borrowing of five legs and two hands for the display. The week of exhibition installation is normally a flurry of activity so I thought I would share some of the photos I took over the course of the installation. I should also mention that the gallery technicians had already been beavering away for a week, preparing the gallery for installation and mounting the display panels but I wasn’t around to take photos of their input! The Foyer case with the cosmetic hand coverings on display. My personal favourite in this case is the hand on the second left with the zip up the forearm. 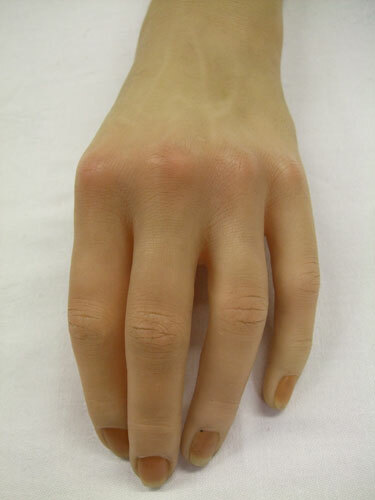 The realism of the silicone hands can be quite unsettling! The first objects going into the case, with Chris Moon’s running blade in the foreground and the WWII aluminium arm in the background. The strapping attached to the prosthetic legs provided a real challenge for the mount maker, Richard West. When you visit the exhibition do take a moment to admire the skill and craftsmanship that went into creating the mounts – they are a work of wonder! 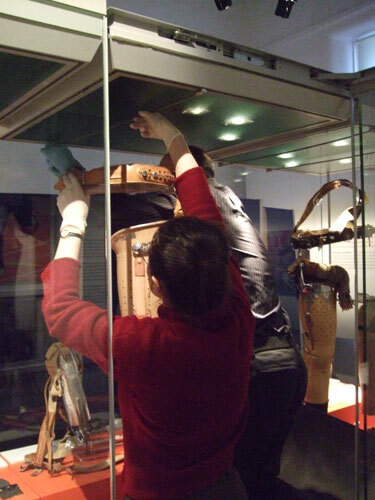 Curator Tacye Phillipson and Russell Eggleton, the exhibition designer, suspend the strapping of the leg using stainless steel wires attached to the top of the case. All installed! Tacye and Russell look on as Richard gives the limb mounts a final check over. Thursday was perhaps our busiest day of the week. Poor Tacye’s day began at the ungodly hour of 06:40 with an interview on the BBC Radio Scotland breakfast programme. The final loan object pictured here in its travelling case arrived from the British Museum and we had the exhibition press view. 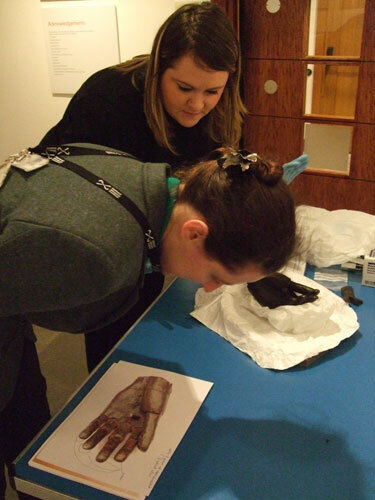 Tacye and Elena Jones from the British Museum carry out the condition check on the hand before it is locked into the case for the duration of the exhibition. 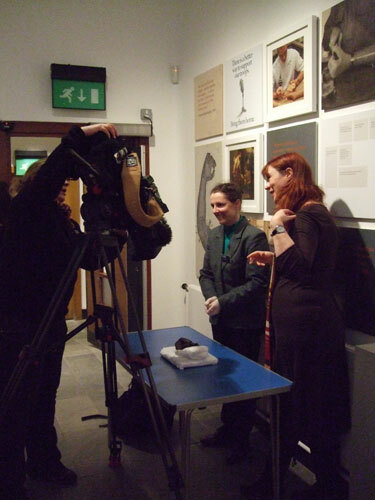 Here’s Tacye being interviewed by Pauline McLean for a feature on the BBC ‘Reporting Scotland’ news programme. Conservator Darren Cox prepares to do a piece to camera on his contribution to the exhibition. Although this didn’t appear on the TV news bulletin, the audio recording featured on the BBC Radio Scotland ‘News Drive’ programme later that evening. 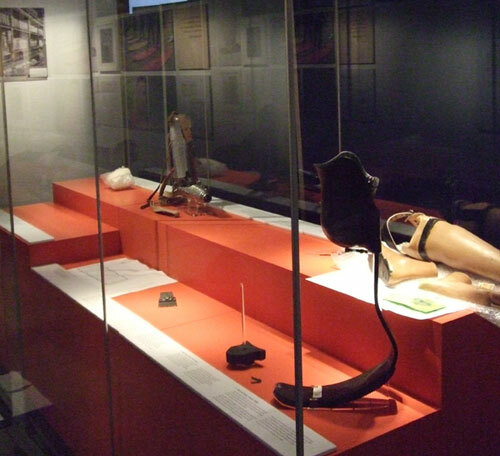 Seen on a photographer’s camera screen is a great shot of Tacye viewed through the exhibition case with a late-20th century prosthetic arm in the foreground. The image of Tacye holding the i-limb ultra was the favoured photograph in the press coverage for the exhibition that appeared the next day. Here she is taking directions from a bank of photographers with the assistance of Kirsty Tough from the Marketing and Communications department. Opening Day! Here we have some of the first visitors to the exhibition taking a closer look at the fantastic photographs which cover the walls of the gallery space. 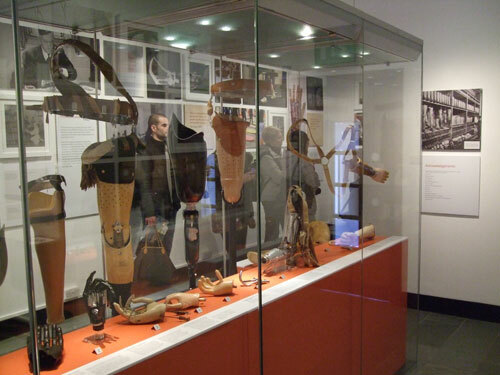 The layout of the exhibition, designed by Jan Dawson uses a combination of text and image to illustrate the development of prosthetic limbs and to show the objects on display in use. 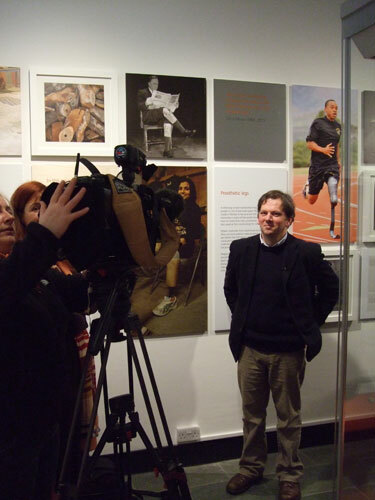 Part of the exhibition is an interview with Chris Moon, MBE. He was blown up by a landmine in 1995, losing his lower leg and right arm. This short film features his personal story and how he and others have adjusted to using prosthetic limbs. 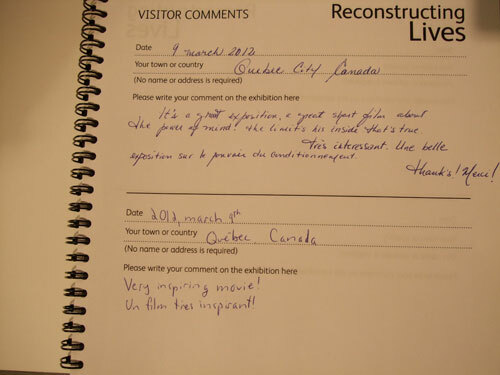 The comments book – it’s great to read visitor responses to an exhibition. Here are the first two comments from a couple of Canadian visitors. 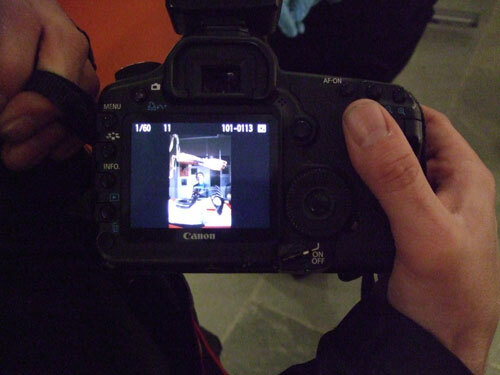 So there we have a behind the scenes glimpse of the exhibition installation. During exhibition planning one of the hardest decisions is what to leave out. 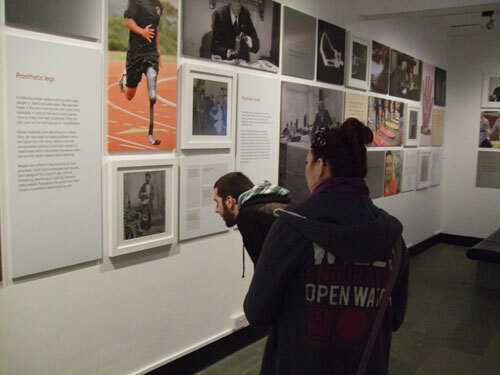 The exhibition about prosthetic limbs, Reconstructing Lives, at the National War Museum is no different. This will display a wide variety of prosthetic limbs, but will not explain how they came to be designed and made. 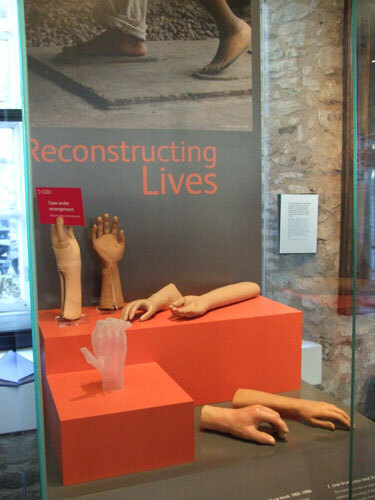 National Museums Scotland has recently been donated a wonderful collection showing the development of prosthetic hands in Edinburgh at the Princess Margaret Orthopaedic Hospital and later by the NHS research team. 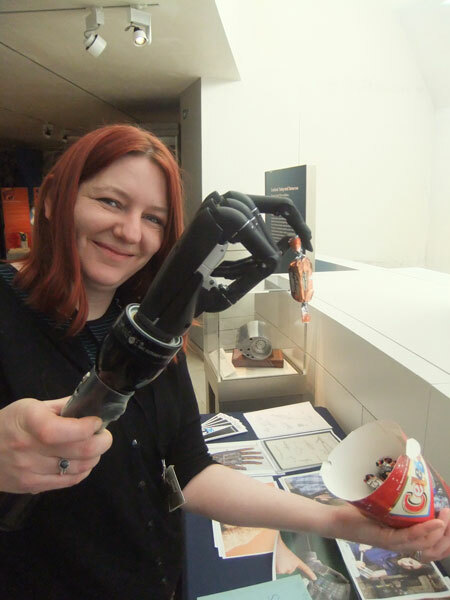 Some examples of their pioneering technological work can be seen in the Shaping our World gallery at the National Museum of Scotland, including the world’s first arm with electrically powered hand, elbow and shoulder, the Edinburgh Modular Arm System (EMAS). 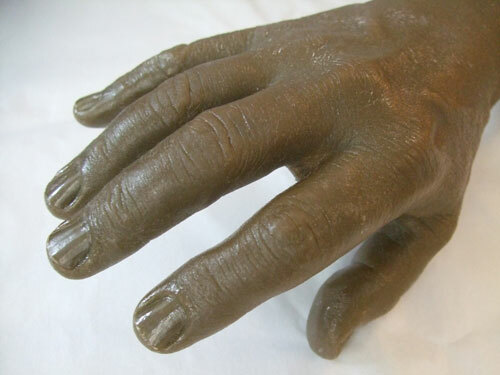 Also in this collection is a set of material used in the production of wonderfully life-like cosmetic hands by a technique perfected in Edinburgh. 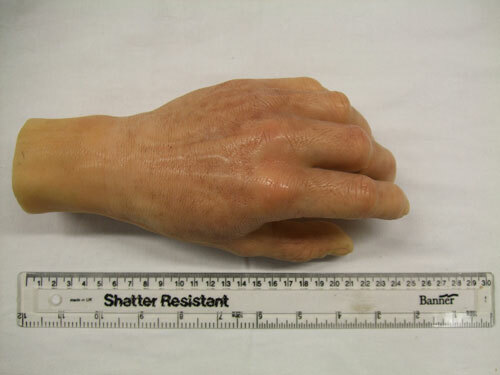 So, how did they make these cosmetic prosthetic hands? The fingers were cast in foam with copper wire down the middle of the fingers so they could be bent to different shapes and posed. 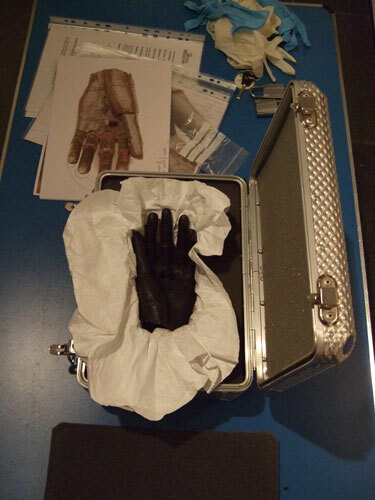 The technician kindly cast a foam hand left unfinished in its mould especially for the museum. Left foam hand in its original mould. The finished foam hands are human in shape, but not exactly skin coloured. Foam hands without their skins. 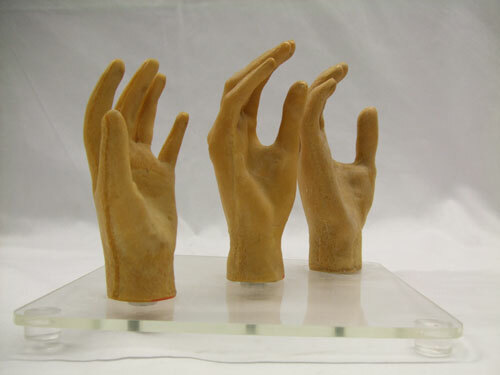 The fingers have wire down the middle so can be bent into different positions..
To make the outer coatings, or gloves, for these hands they found a volunteer with the right size and shape hands and coated their hand and arm in moulding plastic. Pulling this off tore the hair out of the model’s arm. I am assured the detail of the final product was better because of those hairs stuck in the mould. A silicone mould was taken from the master hand, smooth on the outside, but with all the details of the model’s skin, and of those hair roots, on the inside. Lots of these moulds could be made from one resin hand cast. A resin cast was taken from this mould – these master casts were stored in a library of dozens of boxes. 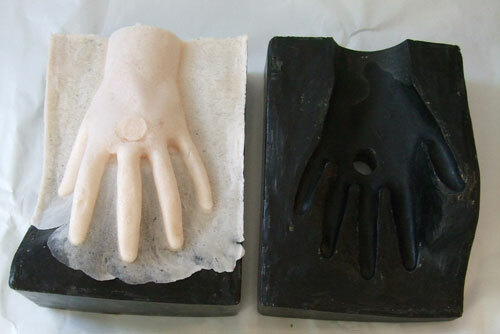 Resin cast of right hand used in the manufacturing of cosmetic gloves. The mould was mounted in a wire framework to keep it in shape. This was mounted on a motor and rotated while the final cosmetic glove was cast inside it in layers of different coloured silicone. Some of these used up to 25 layers of different colours to match the translucency and depth of human skin, though in production the manufacturing was refined down to four layers. 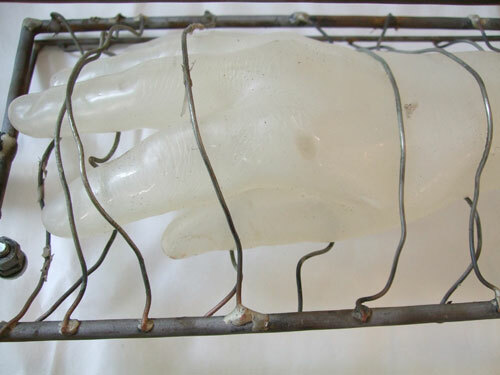 Mould for right arm glove, held in a wire net. Coloured silicone layers were built up inside this mould forming the final glove. Examples of the finished product are in the Shaping our World gallery. Woman’s prosthetic left hand glove.